There are some incredible animatronic and CGI dinosaurs in J.A. Bayona’s Jurassic World: Fallen Kingdom, made possible by the team of practical dinosaurs creators under the supervision of Neal Scanlan and the visual effects artists at Industrial Light & Magic (ILM) and several partner studios. But when you have things like CGI dinosaurs and other effects in your movie that need to be added later, you also often need ways for actors to perform with something on set. That’s where an ingenuous mix of methods came in handy to make the blockbuster film -- from the animatronics themselves, to more unconventional stand-ins like cat litter, inflatable dinosaurs, and even a roller coaster track. In Fallen Kingdom’s first act, former park operator and now dinosaur freedom campaigner Claire Dearing (Bryce Dallas Howard) and her colleague Franklin (Justice Smith) find themselves catapulted inside a gyrosphere over the edge of a cliff on Isla Nublar -- its volcano erupting -- and into the sea. For a stunt like that, actors might normally be filmed against bluescreen and composited into the final scene. But Bayona wanted to see real emotion (read: fear) on the actors’ faces. That would only be possible by replicating a real leap off the cliff. "J.A. said, 'Wouldn't it be cool if we just take them to a theme park and put them on one of those crazy rides where they fly through the air or drop 200 feet and we'll just film them?'" relates Fallen Kingdom visual effects supervisor David Vickery. Realizing that it'd be too difficult to actually go to and shoot inside a theme park, the filmmakers did the next best thing: They built a ride themselves. Special effects supervisor Paul Corbould constructed a downhill piece of track for the gyrosphere to slide down. "I think it was around 40 feet tall," says Vickery. "We had this amazing special effects technician who also worked out the sort of G's that they should be pulling were they to go over a cliff. And then we pushed Claire and Franklin over this piece of track. You can see their terrified faces as they go over. It's beautiful and brilliant and you really believe they're doing it." That roller coaster gyrosphere shot also included, of course, meticulous visual effects work to add in the environment, pieces of the gyrosphere and the surrounding dinosaurs. But having the real actors and something practical is always a great starting point for a final shot. This can be the case even when the effect does not seem that complicated. An example is an earlier moment the characters find themselves confronting a Baryonyx in a bunker, while streams of lava begin falling from the roof. The lava would ultimately be crafted as a digital effect, but during filming, they needed a way to generate a stream of light that would interact with the set and the actors. Any kind of practical lights or LED panels in place of the streams of lava would be too intrusive. The solution? Setting cat litter on fire. "We had this crack in the ceiling filled with cat litter that had been soaked in some sort of flammable liquid," describes Vickery. "There were 12 different nozzles that could drop this cat litter at different points, and that gave us these huge beautiful streams of liquid fire that dropped down from the ceiling. It also gave us this wonderful interactive lighting and a really interesting billowing smoky atmosphere." Meanwhile, the dinosaur star of Fallen Kingdom is the new genetically-engineered Indoraptor, more menacing than any creature previously seen in the film franchise. One of the challenges of the dynamic Indoraptor moments was how to shoot scenes where a CGI dinosaur would later need to be inserted. 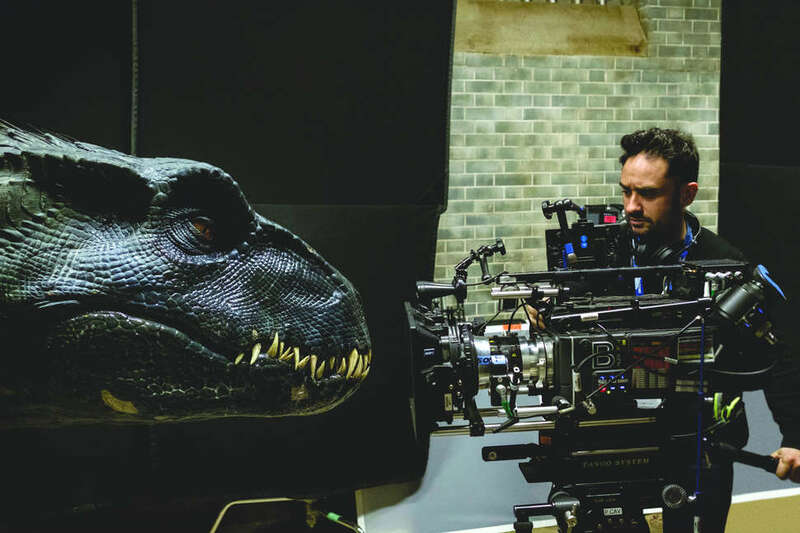 On some occasions, Neal Scanlan’s team provided partial dinosaur animatronic elements, such as a claw or a head for the actors to act against. And then sometimes it involved an inflatable Indoraptor. "That was Neal's idea," says Vickery. "He had two puppeteers hold an inflatable dinosaur and puppeteer that." One person puppeteered the tail, while another was operating the head. They stood roughly the right distance apart from each other in order to fit an 'invisible volume' that would be the CG Indoraptor. "It still sounds silly, but this gave us great eyeline reference," adds Vickery. We’d then insert our CG dinosaur afterwards." 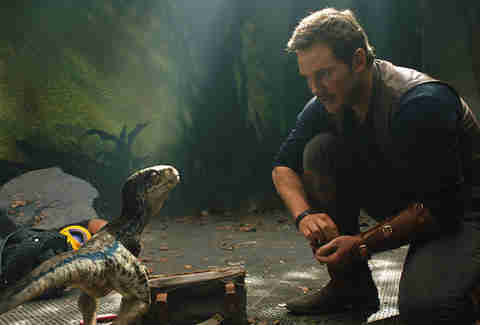 The filmmakers even devised an ingenious way to film flashback scenes of Velociraptor trainer Owen Grady (Chris Pratt) working with the baby dinosaurs. In the final shots, the baby raptors are seen running around on the ground, but during filming, two-wheeled, remote-operated Jumping Sumo Parrot MiniDrone toys stood in for the creatures. "We bought four of them and used them for raptors running around Owen in the wider shots," says Vickery. "They actually have this spring in them that you use to make them jump, which we used just so that Chris Pratt could be randomly going, ‘What's that? What was that? What's that?' It was really helpful." Ian Failes is a specialist visual effects and animation writer and wants to own an Indoraptor balloon. Follow him @vfxblog.